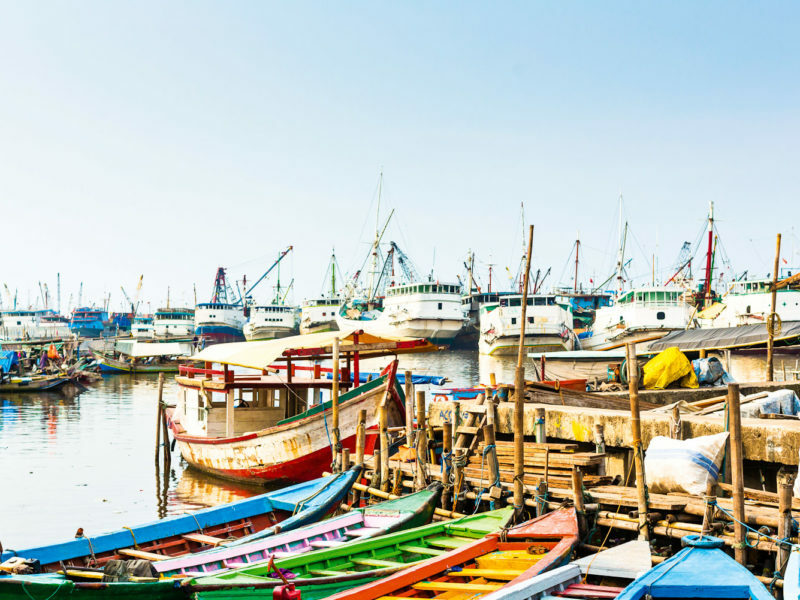 There can be few places that encapsulate the diversity of the world’s most populous island nation in quite the same way as Sunda Kelapa harbour does. The sweeping bows of majestic timber schooners throw shadows across the dock as tattooed Dayak wharfies from Borneo and swarthy Bugis deckhands from Sulawesi offload trade-goods from all over the islands. The ghost of Joseph Conrad seems to drift evocatively through the scent of cloves and timber. Few cities incite such love-hate feelings as the bustling Indonesian capital. Here’s how to get under the skin of this sprawling metropolis with this ultimate 48-hour itinerary. Fans of Jakarta claim that its nickname, the Big Durian, is a nod to NYC (others say it refers to its many and varied aromas). Rise early to experience the frenetic clamour of Jakarta’s oldest traditional market. Pasar Ikan fish market (at Jalan Pasar Ikan) is the perfect place to get a feel for the hectic, pulsating heartbeat of this city of 10 million. Fresh fruit at one of Jakarta’s many street stalls. Later in the day souvenir vendors will turn out to meet the late-rising tourists, but take the opportunity to visit at first-light and you’ll be warmly welcomed by smiling stall-holders. Kick-start your trip in classic style at the spot where modern-day Jakarta itself got started. VOC Galangan Cafe (Jalan Kakap) stands on the premises of a wonderfully renovated Dutch warehouse. Sip your morning cup of Java in a building that dates back more than 350 years or on the sun-blessed terrace, which doubles as a parking place for a 1926 vintage Ford and a horse-carriage. 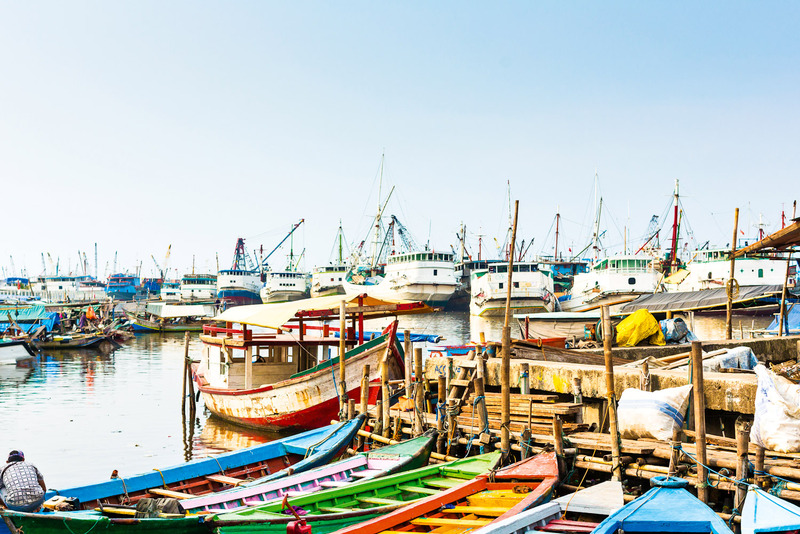 There can be few places that encapsulate the diversity of the world’s most populous island nation in quite the same way as Sunda Kelapa harbour does. The sweeping bows of majestic timber schooners throw shadows across the dock as tattooed Dayak wharfies from Borneo and swarthy Bugis deckhands from Sulawesi offload trade-goods from all over the islands. One of Jakarta’s many tuk tuks. The ghost of Joseph Conrad seems to drift evocatively through the scent of cloves and timber. Flag down a bajaj (a motor-rickshaw taxi) and head back past Chicken Market Bridge – the last remaining Dutch drawbridge – to Daoen Sirih. This large bamboo-roofed food-court near the backpacker ghetto of Jalan Jaksa retains a mostly local clientele and is a good place to chat with locals while you tuck into tasty goat satays or mee goreng (fried noodles). Meals start at about $2, so don’t hesitate to be extravagant! If you’re still feeling adventurous go for an aprés-lunch buzz on an ‘ojek’. These motorcycle taxis are about half the price of a bajaj and their riders blast through traffic jams like crazed horsemen, so it will only take you a few minutes to reach the Museum Nasional (Jalan Merdeka Barat 12). Taman Mini Indonesia (Little Indonesia Park) is a cultural showcase for some of the great diversity of cultures in Jakarta. Built in 1862, this is the most extensive museum of its kind in the country. It closes at 4pm, so if time is tight make a beeline for the ethnology section, which has a mind-boggling collection of artefacts from as far afield as Sumatra, Flores and Papua. Enjoy a traditional sun-downer at one of the many bars that liven up in the late afternoon around Jalan Jaksa. Melly’s Garden (37–39 Kebon Sirih Timur Dalam), with its atmospheric courtyard, is the most peaceful, but for unbeatable people-watching and live music, head for Memories Cafe on Jalan Jaksa itself. Dine in classic style at Cafe Batavia on Fatahillah Square (a short bajaj ride away from the neon-lights of Jaksa). This wonderful old mansion of a cafe is Jakarta’s second oldest building (after the Fatahillah Museum just across the road). The restaurant upstairs offers a good mix of Indonesian, Chinese and Western meals and the atmospheric saloon below will force you into having a last night-cap on the way out. There’s live music most weekdays. If yesterday was all about Jakarta’s rich history then today is about getting an insight into contemporary Indonesia. Dining among some of the archipelago’s fine art at Lara Djonggrang. Start your day with the commuters on a train ride to Jakarta Kota Station (itself a 100-year-old Art Deco gem). Take the north exit and after a 10-minute walk you’ll find yourself at Petak Sembilan Street Market. Located in a traditional residential area off Jalan Pancoran, this market is almost 100 per cent local and a great place to grab a table at a roadside kopi stall and watch the city start the day. Flag down a taxi – Bluebird Company is the most reliable – and ask for Taman Mini Indonesia Indah (Jalan Raya Jagorawi). This massive 100-hectare cultural theme park is 18 kilometres from the city centre, but the ride should only set you back about $9. With attractions representing most of Indonesia’s major tribes and ethnic groups, this is a fantastic way to gain a feeling for the wonderful diversity of the country. Culinary influences from all over the country also mean that it is a great place for lunch. Head back to the city centre for an afternoon stroll through Merdeka Square. The green heart of the city, with its lawns and tree-shaded parklands is one of the biggest squares in the world and is a playground for Jakarta’s inhabitants. There is a deer enclosure and you can watch locals playing football, badminton, or the dramatic foot-volley game known as sepak takraw. Walk to the very centre of Merdeka Square to the National Monument (‘Monas’ to locals). Dubbed as ‘Sukarno’s last erection’ this 132-metre tower took 14 years to build and is topped with a symbolic flame (leafed with gold) that would supposedly shine a metaphoric light that would unify the entire country. Taman Mini Indonesia Indah is a massive 100-hectare cultural theme park is 18 kilometres from the city centre, but the ride should only set you back about $9. It closes at 5pm, so leave enough time to join the queue and take the elevator to the observation deck, which offers phenomenal views from 115 metres up. From nearby Skye bar (on the 56th floor of Jakarta Menara BCA Tower) you can sip cocktails while you look down on the aforementioned National Monument. This is the place to be seen with a frosted sun-downer in hand while you schmooze with the nightly gathering of starlets, pop stars and sundry millionaires of modern-day, boomtown Jakarta. At least a few of the most discerning diners in Jakarta are sure to be heading for Lara Djonggrang (Jl Teuku Cik Ditiro 4), and this lovely restaurant is highly recommended if you want to see how far Jakartan chic has come. Owner Anhar Setjadibrata is a celebrated antiques collector specialising in wonderful works from all over the archipelago. If you ask for a table in the romantic back room, you’ll find that the surroundings are as tasteful as the cuisine and as eclectic as the vibrant city that you might just have fallen in love with. Shangri-La Jakarta is in the business district, a short drive from Merdeka Square. The exclusive Horizon Club on the 26th floor provides afternoon tea with incredible views over the biggest city in Southeast Asia. Some of the most luxurious suites in Jakarta are available from $287. DoubleTree by Hilton Jakarta is perfectly located in the heart of Jakarta’s CBD. Facilities are unbeatable with a choice of restaurants, award-winning spa and a 100-metre pool. Room rates start at $117. Artotel is a wonderful boutique hotel that was designed through a collaboration of Indonesian artists. It has some of the most fascinatingly quirky suites, lounges and dining areas in the city. Rooms start at just $75.